In a new survey of American military personnel, Donald Trump emerged as active-duty service members’ preference to become the next U.S. president, topping Hillary Clinton by more than a 2-to-1 margin. However, in the latest Military Times election survey, more than one in five troops said they’d rather not vote in November if they have to choose between just those two candidates. 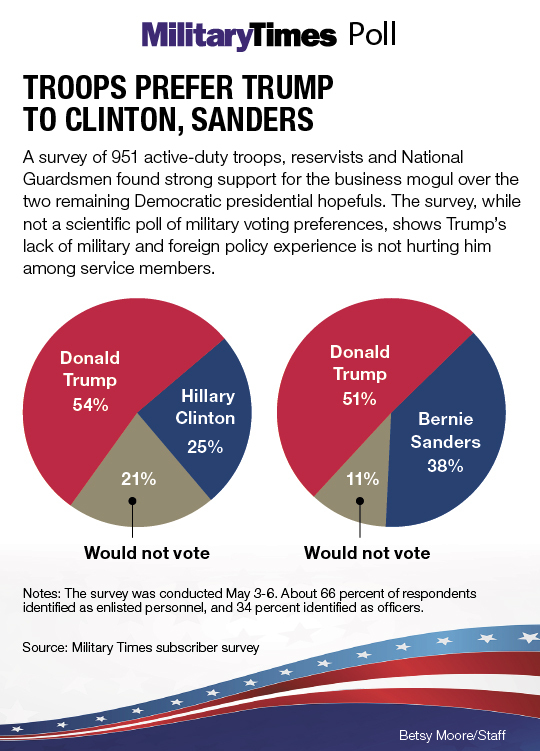 But given only those choices, 21 percent of the service members surveyed said they would abstain from voting.More than 54 percent of the 951 troops Military Times surveyed said they would vote for Trump, the presumed Republican presidential nominee, over Clinton, the Democratic front-runner. Only about 25 percent said they would vote for Clinton in that matchup.